Jim, Brian, and Mart, who had heard the girls racing downstairs, joined them in time to hear Honey answer in her sweetest voice that they would love to have a swim and would be right over. Playfully taking the receiver away from Honey, Brian asked if the invitation included only the girls. "You, too, of course!" answered Peter gaily. "You think I'm crazy? I'd never hear the last of it if Cap or the other guys saw me swimming alone with three beautiful mermaids. I'll meet you in front of our gate in ten minutes," he added, "so step on it!" It didn't take them long to get into their suits, and, taking beach towels as well as shirts and shorts to put on after their swim, they set out for the gate of the Oldest House. On the way over, Jim, looking intently at Trixie, said "Isn't that a new suit, Trix? Nice color." Without waiting for an answer, he dashed ahead to talk to Brian and Mart. 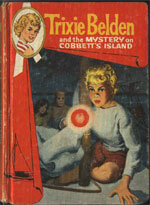 "Jeepers," Trixie whispered to Honey and Di, "he actually noticed what color it is!" 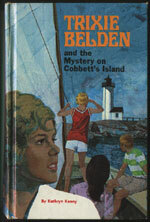 Sleepyside, New York and Cobbett's Island - three to four hours from Sleepyside. The Bob-Whites (minus Dan) head to Cobbett's Island with Miss Trask, where Mr Wheeler has rented a house, The Moorings, for the summer. The adventure begins as they finish their journey amidst a storm and they find the caretaker injured. Later that night, Trixie finds an old letter in a book and as they search for the author and recipient of the letter, they become good friends with their neighbour, Peter Kimball. Peter shares with them the joy of sailing and they become involved in an adventure involving sailboat racing, trying to stop vandalism and the search for money hidden an age ago that could benefit a family in need. Elmer "El" Thomas - caretaker of The Moorings. Slim Novarski - responsible for shooting out the buoy lights and shadowed the Bob-Whites as they tracked down the money. 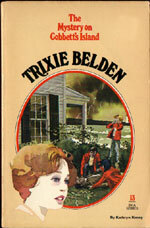 He confronted them with a gun before Trixie managed to outwit them. It's June and the Bob-Whites have just finished school and weren't sure how they were going to spend their summer. Timeline goes out of whack given that they spent the previous two books away from home. Mr Wheeler rented the house on Cobbett's Island so he could go deep-sea fishing on the weekends, but he and Mrs Wheeler went to South America on business. 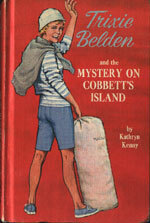 Cobbett's Island is three hours away from Sleepyside. Trixie has $59.72 in her college fund (p. 18) and had just graduated from junior high school. Honey's eyes are described as "hazel and beautifully soft" (p. 19). 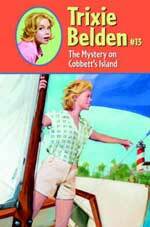 Di had "large eyes that were sometimes deep blue and sometimes almost purple" (p. 25). Jim "managed by some unobtrusive maneuvering" to seat himself next to her (Trixie) on the backseat" (p. 28). Mart tells Peter that Sleepyside isn't far from Fahnestock and they drive up there to ski whenever they can as it has a ski lift and snow machine (p. 71-72). Brian comments that "football was never like this" (p. 79). Since when did he play football? Amusingly enough, Mart doesn't know what monogamous (p. 105) means! Is that a sign of things to come? Jim has apparently had boxing training (p. 215). He seems to do all the fighting while Mart and Brian stand by and watch.